Gisbrook Court, St. Peter's College. An antique steel engraving which has been hand coloured. Circa 1842. A South East View of Ely. An antique line engraving which was drawn and engraved by J. Ryland. Circa 1800. South Prospect of the Cathedral Church of Ely, in Cambridgeshire. An antique line engraving by Thornton published by Alex. Hogg. Circa 1786. An antique line engraving by B.T. Pouncey after T. Hearne. F.S.A. Published in "Antiquities of Great Britain" on 2nd June, 1783 by T. Hearne & W. Byrne. North West View of Ely Cathedral. An antique line engraving by J. Basire after J. Carter. Circa 1812 with later hand colouring. The South Prospect of the Cathedral Church of Ely. More Info An antique line engraving drawn and engraved by Daniel King which was published in "Monasticon Anglicanum, or the History of the Ancient Monasteries, Hospitals, Cathedral and Collegiate Churches by Sir William Dugdale" in 1717. Daniel King was one of the earliest English togographic engravers/etchers and was taught by the well known Wenceslaus Hollar (1607-1677). 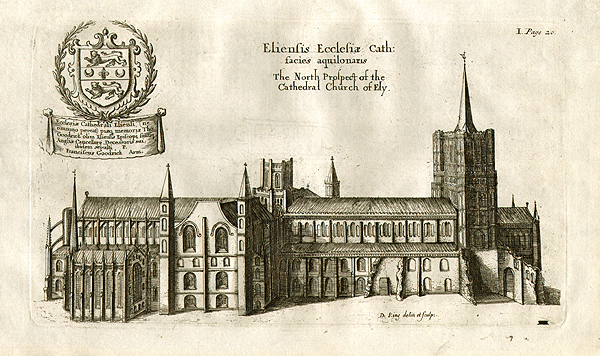 An antique line engraving drawn and engraved by Daniel King which was published in "Monasticon Anglicanum, or the History of the Ancient Monasteries, Hospitals, Cathedral and Collegiate Churches by Sir William Dugdale" in 1717. Daniel King was one of the earliest English togographic engravers/etchers and was taught by the well known Wenceslaus Hollar (1607-1677). The North Prospect of the Cathedral Church of Ely. 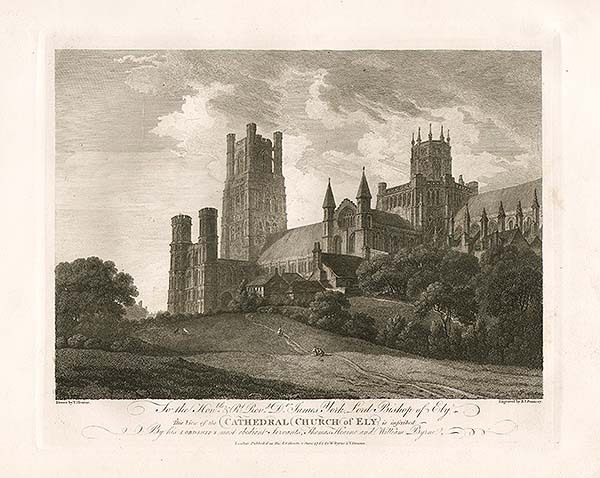 More Info An antique copper engraving drawn and engraved by Daniell King, which was published in "Monasticon Anglicanum, or the History of the Ancient Monasteries, Hospitals, Cathedral and Collegiate Churches by Sir William Dugdale" in 1717. 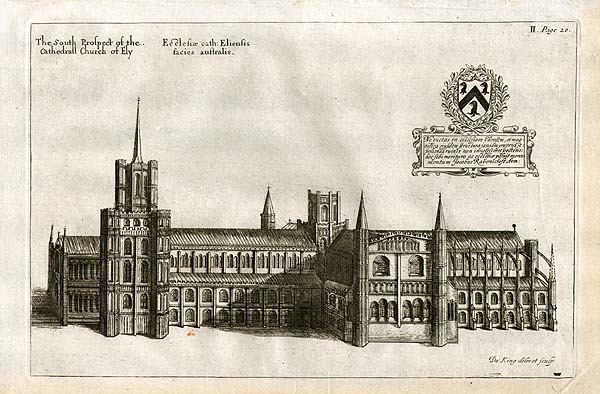 An antique copper engraving drawn and engraved by Daniell King, which was published in "Monasticon Anglicanum, or the History of the Ancient Monasteries, Hospitals, Cathedral and Collegiate Churches by Sir William Dugdale" in 1717. N. W. view of Ely Cathedral. An antique line engraving drawn and engraved by H.S. Storer. Published November 1st, 1817. View of the City of Ely in Cambridgeshire. An antique line engraving published by Alex. Hogg.. Circa 1800. S. E. View of Ely Cathedral. An antique line engraving drawn and engraved by H.S. Storer. Published in 1817. E. End of Ely Cathedral. An antique line engraving drawn and engraved by J. Storer. Published in 1817. W. View of Ely Cathedral. An antique line engraving drawn and engraved by H.S. Storer. An antique woodcut engraving published in "The Illustrated London News." Circa 1860. The colouring is later. North East view of Ely Cathedral. An antique line engraving by B. Howlett after John Buckler F.S.A. published in 1816. An antique line engraving by J. Walker after W. Turner. Circa 1860.